Breast cancer has become a major health problem globally, being the most common female cancer in many parts of the world. In developed countries, the high incidence shows some evidence of plateau, whereas in developing countries, the incidence is generally lower but is on the increase. Whether this will “catch up” with the developed countries remains unknown. As the population base in developing countries is much larger, even a slight increase in cancer incidence means a significant increase in patient number. Henceforth, the investigation and diagnosis of breast lesions is likely to become a major health-care and planning issue. Currently the time-honored triple assessment dictates pathologic evaluation being one of the mandatory assessments of breast lesions. FNAC is expected to play a critical role as it is a much cheaper and quicker investigative modality, and the performance of FNAC does not require special instruments. 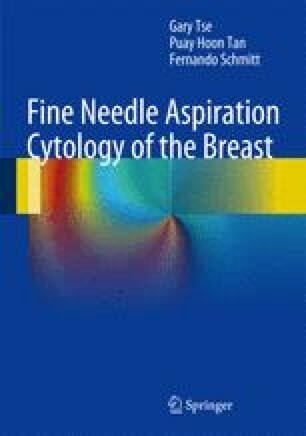 Widespread use of core needle biopsy may not be financially feasible in some of the health-care systems; hence, FNAC will likely to be the method of choice for many of these regions expecting a larger increase of the number of breast cases. Compared to core biopsy, FNAC is more operator dependent, requiring higher skill level in the proper interpretation.